Recently, in a report I read on Metsblog.com, it was noted that the Mets have expressed interest in free agent pitcher John Smoltz. 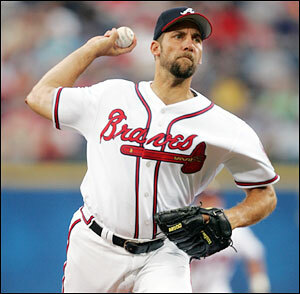 Smoltz, as we all know is a hall of fame pitcher, with great career numbers with 200 wins and 150 saves. The problem with this guy is his age. Smoltz is FORTY TWO YEARS OLD! The Mets already have enough question marks in their rotation, and now they are going to seriously go out and sign a 42 year old former BRAVE (remember what glavine did to us) to a contract? This would be a horrible move for the team. The move would probably generate the same results that Livan’s deal ended up with last year. Instead, the Mets need to sign a young guy like Ben Sheets, Jon Garland or Joel Piniero to a 2 year deal until Jon Niese is all ready to compete in the major leagues. I will be truly dissapointed if John Smoltz is on the New York Mets roster next season.